Inti de Ceukelaire, the ethical hacker from ‘Oilsjt’ in Belgium, is back again. 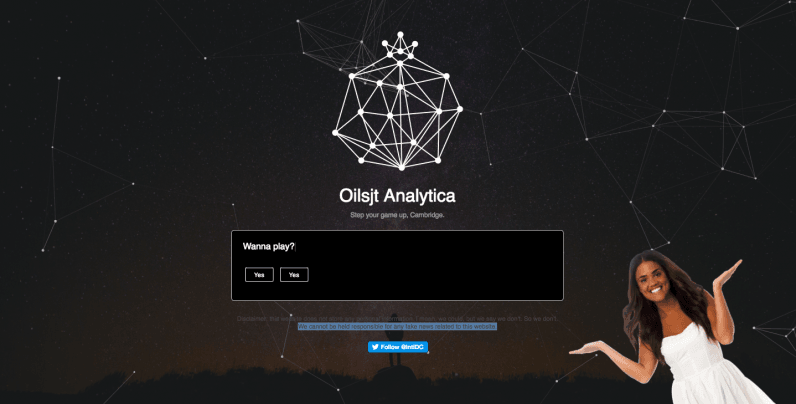 De Ceukelaire has built a tool that can pretty reliably tell who you are after answering 15 questions on his new site ‘Oilsjt Analytica,’ a cheeky reference to Cambridge Analytica’s recent Facebook scandal. I would say it was creepy, but the disclaimer on the website jokes that feeling away. Which also kind of makes me feel like a sucker for giving away data because someone makes light of it. Maybe it illuminates a deeper truth: We don’t care about our data as long as we’re entertained. The Belgian coder made international headlines earlier with some serious and less serious online stunts – once famously buying an expired url Donald Trump had linked to on Twitter, and redirecting it to a song celebrating his hometown. This time, he created a site that guesses who you are, based on a series of questions about your preferences. The site asked me things like if I preferred cats to dogs, if I had kids, and if I liked Coca Cola more than Pepsi, and spit out the correct answer at the end of it. It also worked for a few of my colleagues – and failed for a few others, who were using Firefox’ new anti-Facebook plugin. I reached out to de Ceukelaire about how it works, and he told me “magic!! !” Which probably isn’t true. He also said he’d be explaining how it works in detail on Sunday – April 1. Just for the hell of it, I tried lying to the app, and it came up with my name on the first guess. In incognito mode, it failed miserably, coming up with three totally random names.